Identifying Time Signatures can be complicated, especially when there are 2 (or more) choices. Which answer is the correct one - the Simple Time Signature or the Compound Time Signature? As teachers, we can place an "X" beside an incorrect answer and a "√ " or check mark beside a correct answer. I think that we all would agree that it is essential that students correct their mistakes. But... Does this sound familiar? Okay, there is a reason why the answer is 3/4 or 6/8 right? What is the difference between 3/4 and 6/8? Meet Éliane. 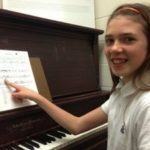 She is in Grade 4 Piano and in Intermediate Rudiments. 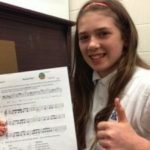 Éliane understands that Simple Times have corresponding Compound Times that can have the same number of notes, but that each Time Signature groups the notes differently. When identifying time signatures, how are notes grouped differently? One way is the beaming of the eighth notes. For example: 6 eighth notes could be 3/4 Time or 6/8 Time. In Simple Time, 3/4 Time uses 3 groups of 2 eighth notes. In Compound Time, 6/8 Time uses 2 groups of 3 eighth notes. Can you tell which measure is now 3/4 and which is now 6/8? There is a definite difference, isn't there! To ensure that she could SEE the difference between the Simple Rhythm and the Compound Rhythm, instead of just putting an “X” beside the incorrect answers, I asked Éliane to count aloud and clap each rhythm to SEE, HEAR and FEEL if it was correct. In the Intermediate Rudiments Workbook, Page 91 #2, Éliane had the answer 6/8 as the Time Signature for the Rhythm in the first measure (seen here below). Éliane could SEE that there were notes that equaled 6 eighth notes. When she tried to clap it, she could HEAR that she could not count it properly for 6/8 time. She could FEEL that the pulses just didn't work with how the notes were grouped. So, she clapped it again counting it in 3/4 time and, voila, it worked! Step 1: SEE the patterns of notes beamed in groups of 2 or 3. Step 2: HEAR as you count aloud, clap the rhythm and listen for the counts to match the groupings. 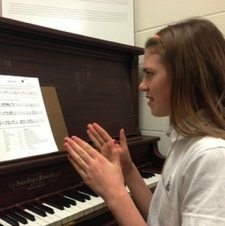 Step 3: FEEL the rhythmic pulse as you count aloud and play the rhythm. See + Hear + Feel = The Way to Score Success! Rhythm and Rests can be a tricky subject to teach. I often receive emails from teachers who just need to be reassured that they are on the right track. 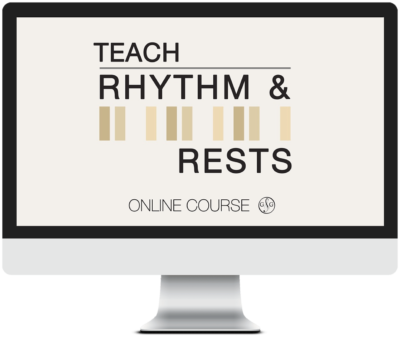 So we created an online Teacher Training Course - Teach Rhythm and Rests just for you! This 8 Video Series includes downloadable worksheets with examples and exercises. If you have ever second-guessed yourself on a Rhythm and Rest Question, for only $7.00, you will learn how to teach Rhythm and Rests more effectively. This is a $200.00 Value and for a limited time, it is yours for only $7.00. P.S. - Join the Conversation: When marking your students pages, how do you indicate that they have written an incorrect answer? I have a band leader I play keyboard with that swears that the time signature for the traditional hymn To God be the Glory is in 12/9…we have discussed the obvious things if course but he says he looked it up and found it was called 12/9 because the bottom note in the signature is a dotted – quarter so it was called 12/9. Can you help me understand how he got this understanding? I have two under-graduate degrees and one masters in music and I have never heard of it. Obviously, this Band Leader needs to take the UMT course; go back to the basics! !